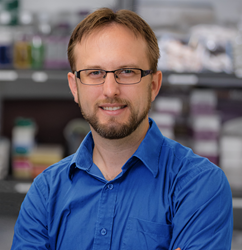 Dr. Goldsmith will share the role the company’s graphene biosensor plays in increasing the speed and efficiency of small molecule drug discovery. The cost of drug development has risen astronomically over the past decade, and researchers are arduously pursuing ways to increase the success rate of candidates that go through the pipeline. Dr. Brett Goldsmith from Nanomedical Diagnostics, a company pioneering graphene biosensors that accelerate pharmaceutical and biotherapeutics development, will present a session called “Novel Graphene Field Effect Biosensing Technology for Binding Kinetics” at the Society for Laboratory Automation and Screening (SLAS) Conference on February 5 in San Diego. The company’s proprietary FEB technology is a breakthrough electrical label-free technique for characterizing small molecules and proteins, providing affinity, kinetics, and concentration analysis with micro-volume sample sizes and nanograms of target material. Compared to current optical methodologies such as surface plasmon resonance, Bio-Layer Interferometry, or ELISA, FEB provides numerous advantages in small molecule drug research due to its electrical sensing mechanism that does not rely on measuring mass-dependent variables. Instead, FEB measures changes in conductance which generate high responses with small molecules. Dr. Goldsmith will discuss the basics of graphene biosensor architecture and technology with a focus on use cases with the company’s FEB product, Agile R100. He will showcase characterization of small molecules and proteins including difficult G-protein-coupled receptors (GPCRs), low concentrations of Zika biomarker, and the use of solvents and detergents with great success. SLAS is a premier organization that brings academia, industry, and government together to advance life sciences discovery and technology research. Visit the Nanomedical Diagnostics booth (#332) at the society’s annual conference from February 5 through 7 to learn more about graphene biosensor Agile R100 and FEB technology. Nanomedical Diagnostics (“Nanomed”) is a life science company based in San Diego, CA. Nanomed has developed a breakthrough electrical assay based on proprietary Field Effect Biosensing (FEB) technology that delivers sensitive label-free kinetic characterization of biomolecular interactions for accelerated drug discovery. As the world’s only mass-manufacturer of next-generation graphene biosensors, Nanomed’s mission is to transform the healthcare industry with innovative new products that enable cutting-edge life science research, drug discovery applications, and portable diagnostic and health monitoring platforms.